» Recent Highlights » Where Do Homeless People Come From? Homelessness is often considered an “urban problem.” New analysis from the Center for Evidence-based Solutions to Homelessness uses HMIS data to track where people entering shelters come from. Homelessness is often considered an “urban phenomenon” because people are most likely to experience homelessness in cities. Analysis based on Homeless Management Information System (HMIS) data in two states, Michigan and Iowa, shows that most people who became homeless in cities in those states between October 2007 and September 2008 were already living in cities, but that a fair number of people using emergency shelters or transitional housing programs in cities reported their most recent “housed” location as a suburb. 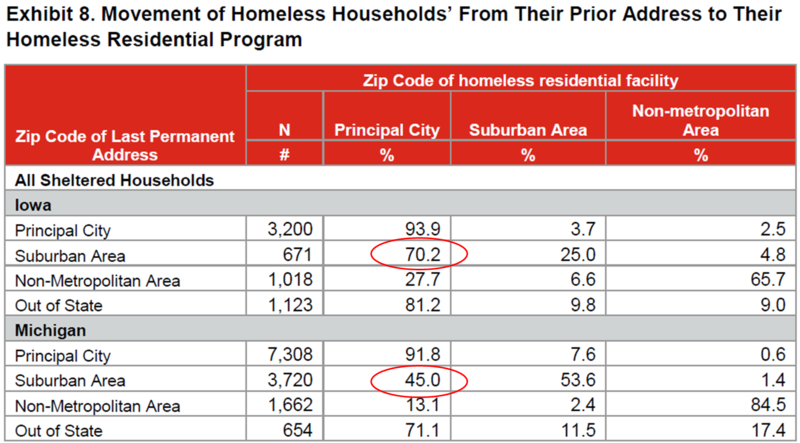 Among homeless households in Iowa, for example, only 25 percent of households whose last permanent address was in a suburban area used a homeless facility in the suburbs. A majority of suburban families (70%) instead sought shelter in urban areas. In Michigan, among homeless families whose last permanent address was in a suburban area, 45 percent used a homeless residential facility in an urban area. The analysis also looked at the characteristics of the neighborhoods from which people were most likely to become homeless and found that neighborhoods with low rents in Michigan and neighborhoods with concentrations of minorities in Iowa were common “feeders” into residential programs for homeless people. Originally written as a supplemental report to HUD’s Annual Homeless Assessment Report (AHAR), this report is being released here for the first time.